The fourth book takes us in a new direction then what the first and second book have set up. I see how some people were angered by it, but I couldn’t be happier with how things are turning out. This book was like a new beginning for the series, a breath of fresh air. Not only do we get some new plot twists and characters to fangirl over, but we also get closure on the story lines from the first three books. 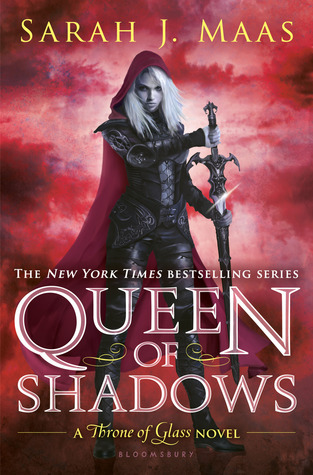 I highly recommend Queen of Shadows by Sarah J. Maas if you are a fan of high fantasy and badass female characters. But I would recommend starting from the beginning of course! One should never start in the middle. Let me know down below what you guys thought of this book. Do you like where the story is heading? Anything that bothered you about the book? I would love to read your opinions! This entry was posted in Menu and tagged Action & Adventure, Bloomsbury USA Children's, Fantasy, Magic, November, Review, Romance, Sarah J. Maas, Young Adult. Bookmark the permalink. It’s interesting how you viewed this book as a new direction, while I viewed it as the conclusion to the first 4 books and now the last two will be a different story. I felt like with the King dying, magic being freed, Aelin off to start her kingdom it all felt very endish to me. And like the next book a whole new storyline will begin. I totally agree with all the ships! I want them all to happen! Everyone to be happily partnered off and in love! Rowan is by far my number 1 book boyfriend! The sexist character literally EVER! I’m so glad you enjoyed the book! Now only like 11 more months until the 5th book! Kill me now me now and put me out of my misery! I honestly can’t wait for book 5! OMG.. its going to be so good! That is totally going to happen… this series is going to end and eff everyone up in the process. I can feel it already. DAMMIT. Here you go again liking the same guys as me again 😦 But Rowan is so awesome that I understand ❤ I don't know how I feel about Dorian and Manon yet. It seemed to come out of nowhere and was a bit strange. But if it's developed well in the next few books I can totally see myself aboard that ship!